The building has no water, alternative facilities available at Castle Semple in Lochwinnoch. Muirshiel Visitor Centre will be closed this weekend and until further notice. There is a problem with the water supply to the building. This means there are no toilet facilities and the Centre will not be open this weekend. 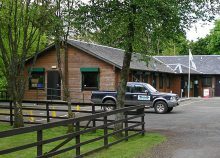 There are alternative facilities available at Castle Semple Visitor Centre in Lochwinnoch. Apologies for any inconvenience caused. We will update this post as soon as the problem has been rectified.